Sometimes a color scheme is exactly what you need to get the ball rolling. Like if you are planning a wedding. Or a nursery. We don’t know if we are having a boy or a girl and since we are not into the whole blue for boys and pink for girls thing, it really doesn’t affect our planning in any way (except that we need 2 name short lists). Alec’s room ended up having aqua highlights since it was designed long after he was born and he already had several lovely pieces that ended up setting the tone. Light blue also goes well with the light grey wall color that we actually have throughout our flat, including in the nursery that we are going to design now. Since I have no painting plans for the nursery, the wall color is something to be contended with. I like it, but since the room itself is not the lightest, everything else has to be kept very light so it all doesn’t get too cloudy feeling. 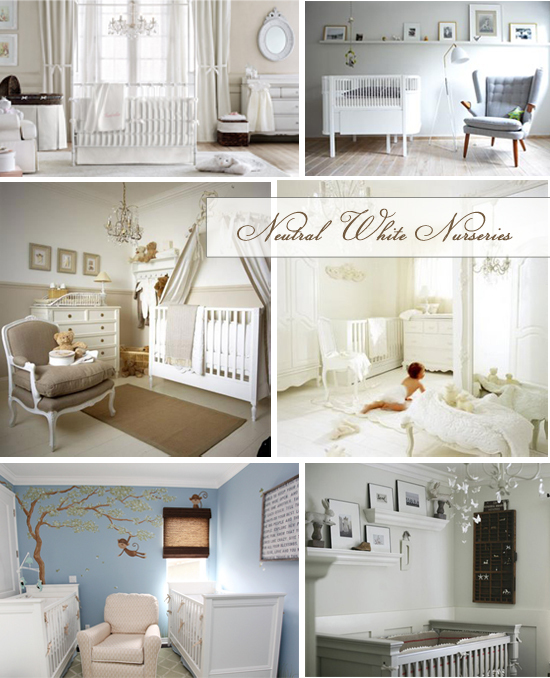 One color scheme that I love for nurseries is white. It is so soothing and lovely for a baby. It has the gender neutrality that I like. And it grows so well with the child since nothing is more playful than the pop of color that kids’ toys and books naturally have, against a bright white backdrop. This nursery is never going to be white white since the walls are grey, and the floors are naturally colored wood, but white could still be a very pleasant option.